Ships from and sold by Wordery USA. 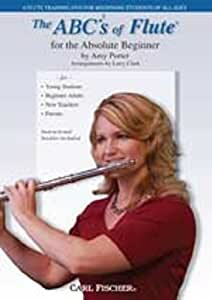 Carl Fischer Music's new The ABCs of Flute features world-renowned flutist and pedagogue Amy Porter. This DVD is a comprehensive beginning study guide to playing the flute with information about breathing, embouchure, hand position, air direction and caring for your instrument. It also features tunes with up to six notes, and ventures briefly into the upper and lower octaves. Amy Porter performs the featured tunes with piano accompaniments arranged by Larry Clark. This DVD also includes a 16-page instructional booklet. For beginning players. Very well put together material. Very useful and understandable even by a person like I who is not directly connected with formal learning of music, but pursues it as one of the areas of knowledge and explores it to comprehend the real beauty. I am satisfied with the very valuable guidance and getting the notes out of the instrument. Beautiful performances by the Flutist for playing along at manageable speeds. The music reading section has clear, very easy to follow explanations. Booklet with all the songs is very helpful. Nice, non-threatening way to begin playing flute.